The problem with most capable subwoofers Ive had in the house is that theyre just too damn big to fit comfortably in a room of small to medium size. There are often only one or two places in such a room that can accommodate a subwoofer with a volume of 2.5-3 cubic feet, and frequently those spots are not the best positions sonically. To add insult to injury, the typical black-painted or vinyl-laminated box isnt usually all that pleasant to gaze upon. This has prompted many an audiophile to seek new ways to hide the latest addition to the audio arsenal from their spouses disapproving glares. And who can blame the spouses? I take no great pleasure in staring at a big, ugly black box in the front corner of my moderately sized listening space day after day. Luckily, there are alternatives. One is the Rocket UFW-10 ($599 USD), which has been the primary reproducer of all things low-frequency in my home theater for the last few months. The UFW-10 is an elegant cube measuring only 13.25"W by 13.5"H by 13.0"D, and weighs 52 pounds. My review sample came in stunning Macassar ebony, a wood veneer similar to African rosewood but a shade or two darker. The top and bottom caps are finished in a flawless piano-black lacquer that perfectly complements the side panels. The finish is far nicer than that of most of the furniture I have in the house, and is light-years ahead of virtually all of the audio and video equipment the sub is currently sharing space with. 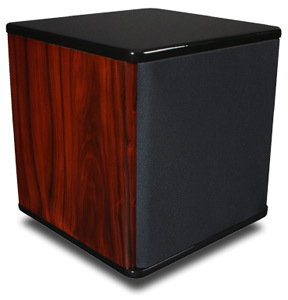 The 10" alloy woofer on the front hides behind a simple grille of black cloth that blends nicely with the cabinets rounded edges. The UFW-10 rests atop four heavy cone feet of brass that screw into the bottom. Brass discs are supplied to protect wood floors. What first drew my attention to the UFW-10 was not its stunning finish but its unusual combination of features and price: small size, relatively high amplifier power, and the unusual inclusion of a single-band parametric EQ and XLR input, all for $599. One thing I already knew about was the usefulness of parametric EQ. My Anthem AVM 20 preamplifier has this feature built into its bass-management system, and Ive found it incredibly helpful for taming a particularly nasty 45Hz peak at my theaters primary listening position. However, parametric EQ is unusual in most high-end processors, and, to my knowledge, nonexistent in the price range occupied by the range of receivers the UFW-10 is likely to be paired with. If the sub performed well in other areas, I thought, then this feature could have a significant impact on the overall sound quality of the average system. For this review, my system consisted of two Magnepan MMG W speakers, a Cayin TA-30 integrated amp, and an Adcom GCD-600 CD player, all connected with Analysis Plus cables. Setting up the Rocket UFW-10 in my tubed audio system along with my Magnepan MMG Ws consisted of finding a suitable place for the subwoofer and setting the crossover, phase, level, and parametric EQ. Once placed in my system, the UFW-10 sounded best when placed about 1 from the right front corner of the room, a position that has produced boomy output with several larger subs. Aside from this, I experienced no surprises in setup. I still got the same 45Hz response peak I had with other subs, but, as with my Anthem preamp, the Rockets parametric EQ was able to correct the problem. The subs small size allowed me to experiment with unconventional placements, such as the middle of the left side of the front wall. This tamed the response peak somewhat, but at the expense of low-frequency extension and output. So back it went into the corner, where the room gain associated with corner placement helped extend the UFW-10s performance into the realm of its larger competitors. Rocket has done an excellent job of explaining some of the finer points of setting up the UFW-10, including how to use a RadioShack sound-pressure-level meter to measure the response, interpret the results, and use that information to best integrate the sub into a system. The advanced calibration techniques illustrated in the manual are a bit more involved than the average listener may be used to but are well worth the extra effort. The instructions for adjusting the parametric EQ are particularly helpful, and should be followed to the letter. Perhaps if more manufacturers took this sort of care and buyers actually read the instructions, I wouldnt have to sit through so many awful subwoofer demonstrations. On the Blue Man Groups "Piano Smasher," from Complex [Lava 83631], the Rocket UFW-10 produced bass notes down to almost 25Hz without overpowering the Magnepan MMG Ws or degrading my systems overall quick response. 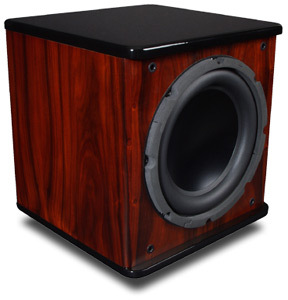 Maggies are known to be relatively hard to mate with a subwoofer, and the subs recommended to be used with them are usually quite expensive. But the UFW-10 may just be the perfect sub for the Maggie owner on a budget. Many subs with good low-frequency extension sound downright tubby when pushed hard across their entire spectrum, but never the UFW-10. If you think a small subwoofer cant reproduce deep bass, think again. The UFW-10 proved its ability to reproduce low organ notes well into the 20Hz area with Mary Prestons recording of Marcel Duprés The Way of the Cross, Op.29 [Works for Organ, Vol.11, Naxos 8.554379]. No, it didnt reproduce those 20Hz notes at full blast, but it did amazingly well from 25Hz on up. This was incredible performance from a subwoofer a third the size of much of its competition. The "Darla!" scene, from Finding Nemo, is one of those little surprises that pop up in kids movies from time to time. The bass from Darlas finger tapping on the glass is at once sharp, defined, and room-shaking. The Rocket had no problem with this passage; the seamless blend with the quick, clear Maggies produced a startlingly realistic sensation that was completely unexpected. I thought at first that maybe I shouldnt expect too much low output from such a small subwoofer, but I was proven wrong. No, the UFW-10 didnt reproduce 20Hz signals with the ferocity of some of its larger brethren, but the fact that it reached 20Hz at all was quite surprising. In the final chapter of The Matrix Reloaded, the rumble caused by the arrival of the rescue ship could be heard and felt. What really caught me by surprise with this scene was the fact that I could measure usable output down to almost 20Hz. Sure, the UFW-10 started to roll off at around 30Hz, but it was a gradual rolloff that left plenty of output at 25Hz, and output that was still audible at 20Hz. The subwoofer closest in price to the UFW-10 that I had on hand was the $849 Hsu Research VTF-3. But proximity of price is about the only thing these two very different subwoofers share. The VTF-3 is, in many ways, an "old school" sub -- a big, utilitarian box that makes no apologies for its size or appearance while delivering deep, authoritative bass that shakes the floor, rattles the windows, and loosens your fillings. But the Hsu is at its best in larger spaces, being physically too large and acoustically too powerful to comfortably fit my smaller rooms. The Hsu was best suited to my relatively large main-floor family room, which opens to both the kitchen and entryway; there, it could shake the foundation. The Rocket UFW-10 was able to play in this space, but couldnt hope to compete with the Hsus depth and power. The UFW-10 really came into its own when I moved it into my 15 by 18 theater, where it played as loudly as I could stand without ever overpowering the space -- something that was occasionally a problem with the Hsu in this room. Both subs were tight and tuneful on all material, but particularly with music, the Rocket UFW-10 seemed to have more control. In the subwoofer world, size matters. However, sometimes its the smaller, more nimble competitor that wins the race. The Rocket UFW-10s diminutive footprint presents a lovely alternative to the conventional subwoofer and offers a host of previously unavailable placement options. The sub is relatively easy to hide away in a corner or behind a piece of furniture, though its finish is good enough that that would be a shame. This is the rare piece of audio equipment that deserves space in the light of day. All that would mean nothing if the Rocket UFW-10 didnt hold up on the performance end. It does that exceedingly well. While not the last word in extension or overall sound-pressure levels, the quality of the UFW-10s usable output is at least a notch above almost anything else Ive heard in its price range. That it performs these feats with such high style and elegance is a fact that the competition would do well to recognize. This is a terrific sub.